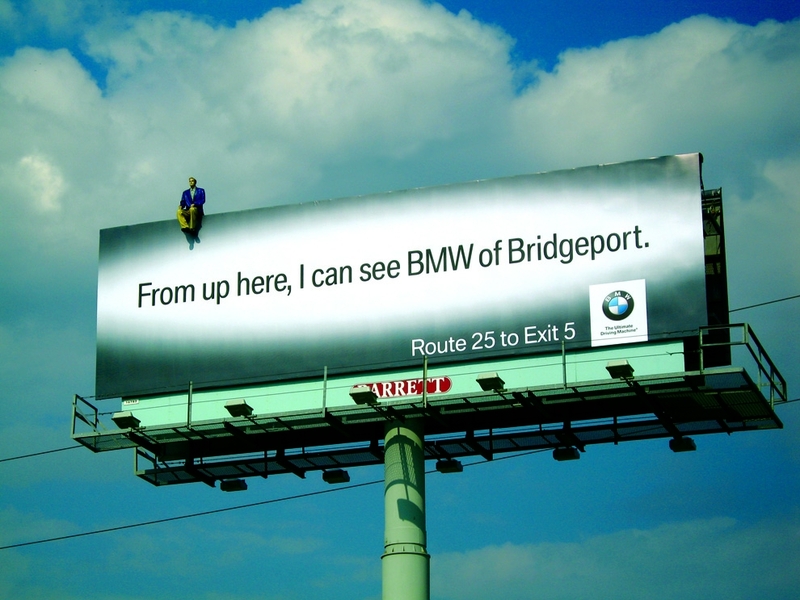 Apparently, the client, BMW of Bridgeport, CT, loved this billboard so much, they asked the agency, VogtGoldstein to create a series. Perhaps something like, "From up here I can see New York and I wish I lived there instead of here." Or "From up here, I can see BMW of Greewich and it looks like they have a much better selection of cars." Give it your best shot VogtGoldstein. Ok since I always pick on billboards here goes. If you can tell the little spot on the top of the billboard is a human at 30 to 70 miles per hour,it's not bad. Simple to the point and interesting. I always thought that the kind of people that bought BMWs had an innate sense of direction, that leads them just to BMW dealerships. That said, I'm surprised that finding the dealership is the company's biggest sales hurdle. The fact that it�s in Bridgeport is its biggest hurdle. Given the location of this billboard, it is unlikely that anyone in their target "drive time" audience is driving by at 70 MPH, more likely crawling at 25 MPH at best. From up there, he can also see countless drug deals and robberies, but that doesn't mean I want to go to Bridgeport for anything. From up here, I can see you picking your nose. Cut it out!